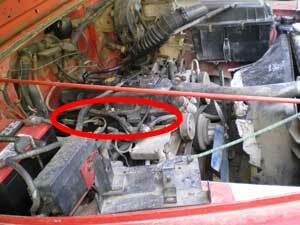 This is a view from the top, passenger side of the vehicle, under the hood. Make sure the engine is cool and the battery is disconnected before you begin. 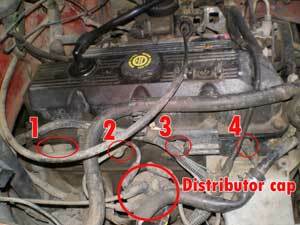 The location of the spark plugs is illustrated below. © 2003- MyJeepWrangler.com. You may not copy for any reason without permission. Jeep™ is a registered trademark. MyJeepWrangler.com has no affiliation with Jeep™.